What did play mean to you as a child? Was it basketball in the driveway? Hide and seek with your friends? Digging in the dirt, or just being by yourself with a good book? For a child who lives in safety and security, those moments can form some of the best childhood memories. But what happens to a child who grows up amid homelessness, violence and hunger? 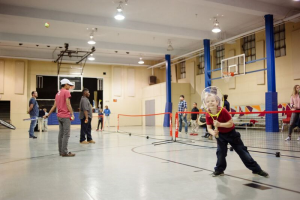 At Brookside Community Play, volunteers and staff work with children from first through fifth grades and provide them a safe space to learn and grow through free, play-based afterschool programs. 1 in 5 children in our community doesn’t get the safe and nutritious food they need. In Brookside and many other neighborhoods served by Second Helpings, the numbers are even higher. And for those children, missing a meal isn’t just about going hungry. It impacts their development and their ability to focus on school, homework and the freedom to just be kids. Worst of all, access to food becomes even harder for struggling families through the winter months. With your help, Second Helpings will send thousands of warm, nutritious meals to children at Brookside Community Play and throughout our community. When you give to Second Helpings, the impact of your gift is multiplied. The meals you provide support the important work of more than 90 partner agencies that fight homelessness, domestic violence, addiction and so much more. Among those partners are critical organizations like the Julian Center, Dayspring, Boys and Girls Clubs and many others offering a safe, caring space to children and families in need. At $1.20 to prepare and deliver a meal, every dollar you give to Second Helpings makes a big impact. When you support Second Helpings, every dollar stays within Central Indiana, and serves as an investment in your community. Your gift of $120 sends 100 meals to a high-quality daycare or afterschool program in your community. 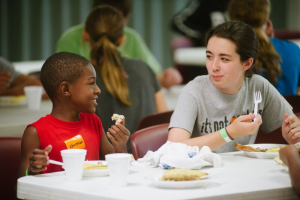 A gift of $3,900 can support meals for an afterschool program for six months. With your help, Second Helpings can provide an additional 50,000 meals for our neighbors this year. Your support will help to ensure that more children throughout our community have warm, nutritious meals this winter. Your gift helps to provide the support and resources children need to learn and grow. But we can’t do this work without the help of caring people like you. As you gather with family and friends this holiday season, I hope you will join me and my family in sharing your blessings with those who still need our help. Please consider a generous gift to Second Helpings today to warm the bellies and hearts of our children, and offer them the opportunity for a brighter future.